Customers who which to receive "Replacement" pricing, MUST include, with their payment, the serial number which is on the bottom of each page of their NU-CONcept manuscript. The serial number will be cross referenced with the purchaser's name before delivery of the replacement product. Easy to use....just like the original products. All NU-CONcept products were designed with maximum deception in mind. The replacement products will be the same as your existing product, unless a new generation with more advanced features was released. In this case, the purchaser will advised of the change and will be provided with any new instructions, if necessary, before shipment. The NU-CONcept Manuscript, video CD, stamp seals or any other accessories are not included with "replacement products" because existing customers already have these materials. You will only receive the new replacement product you ordered with a few sample cards which will be marked with YOUR product. This is done to insure the quality of each product shipped and to provide you with additional samples of what the final marked cards should look like. 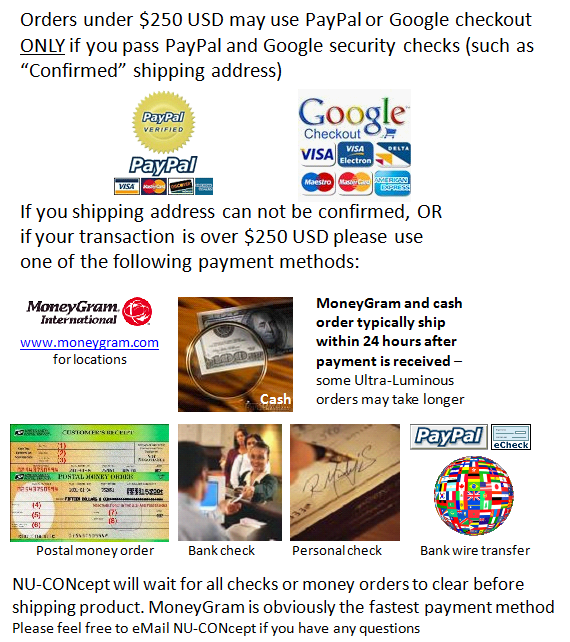 Since I did not set up a PayPal shopping cart for these products, if you are a verified PayPal customer with a conformed shipping address, please go to PayPal directly: Payment should be sent to "payment@marked-cards.com" AND please specify in the PayPal comment field what you are ordering.